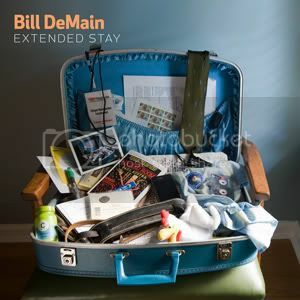 By the end of 2011, Bill DeMain had already released nine albums as one half of Swan Dive (a band who’s 2009 release ‘Mayfair’ featured several co-writes with cult singer-songwriter David Mead), but surprisingly, this 2012 EP marks his first foray into recording as a solo artist. The release of ‘Extended Stay’ comes at the end of a distinctly wobbly time for the Nashville singer-songwriter, first having his home flooded – losing various irreplaceable notebooks in the process – followed by losing that home entirely due to a fire; a fire which lost him 80% of his belongings. The title and suitcase adorning the sleeve represent the bohemian existence DeMain was forced to adopt for a year following the disasters. Given the events which preceded the EP’s release, you might think ‘Extended Stay’ would be a soul-searching, perhaps even naval-gazing, downbeat affair. Yes, it’s largely structured around pieces written for acoustic guitar or piano and yes, in places, there’s often a focus on the lyrics; it’s even possible to say most of the tunes have a softness and reflective quality uniting them, yet somehow it rarely feels like a down release. The main hook from the opening cut works around its title, ‘Looking for a Place to Live’, yet bizarrely, the lyric pre-dates the fire. DeMain’s soft wocal style weaves a pleasant melody against an equally lovely finger-picked guitar, as the time signature is laid out in a foot-tapped rhythm (not unlike McCartney’s well-worn composition ‘Blackbird’). That’s enough to make the tune work on its own merits, but as it progresses, DeMain brings in some harmony voices, a cello and electric piano to fill out the arrangement. In all, it’s one of the EP’s most enduring cuts. Need another incentive to check out this tune? It’s co-written with another Nashville musician, Daniel Tashian, who is one of the finest pop writers of his age; in fact, ‘Chateau Revenge!’, the 2010 release from Tashian’s band The Silver Seas ranks among the finest retro-pop/power pop releases ever. Although retaining an acoustic backbone, ‘St. Joes ’75’ has a more flippant mood, coming as it does with more than a dash of rhythmic inspiration from Bowie’s ‘John, I’m Only Dancing’, before morphing into something that sounds like T.Rex reworking an idea from Brian Wilson. DeMain sounds solid vocally and the acoustic work provides a good basis, but for that all-round 1970s feel – which it’s obvious DeMain is striving for – the saxophone is key. There are plenty of saxes throughout these three-and-a-half minutes, pushed high in the overall mix; at times the sax work appears jaunty, at others, just a little too obtrusive. As a disposable piece of glam-tinged pop it works well enough, though its religious bent mightn’t be well received by all. Perhaps the EP’s best tune overall, ‘Common Love Song’ combines guitar and piano on a mid-paced arrangement which has a McCartney-ish air. More specifically, it’s a number which could have graced any number of Wings albums in the 70s. After what sounds like it could’ve been a false start, DeMain’s smooth vocal calls out gently above a drum beat and simple piano chords. This would have been a good enough number as is, but a ringing guitar on the chorus gives things a slight lift. To hammer home the seventies-ness (and the track’s only real weak link), some ugly, unquestionably dated keyboards fill a space which could have been better filled by a tasteful guitar solo. There’s a fine line between cool and retro and trying too hard…and DeMain comes dangerously close to crossing that line here, but since most of ‘Common Love Song’ sounds like an almost classic piece of singer songwriter pop, he can be excused! The rest of the EP takes on an often more subtle vibe. ‘In Your Letter’ offers a very interesting piano melody, over which DeMain’s vocal is fairly saccharine, but totally sympathetic to the mood. As with ‘Looking For a Place to Live’, it’s the addition of strings which really gives the tune strength. Vocally, however, there’s nothing striking here – though perhaps “obviously striking” was never DeMain’s intention; even the best cuts on this EP can take a few spins before they start to take a hold. More analog synths appear in the middle of ‘Honeylove’, an otherwise sweet acoustic ditty. Short and simple, it’s DeMain’s vocal which really carries this song. As a standalone track, it may not feel like much, but as part of the complete picture, it’s another good example of DeMain’s gentle touch as a songwriter. ‘In Your Letter’ and ‘Honeylove’ definitely don’t hold as much magic as some of the better tunes here, but it’s unlikely you’ll find the urge to skip either of them. With its hint of New York and Randy Newman, ‘Raggedy Man’ (a co-write with David Mead) is reminiscent of parts of Mark Bacino’s ‘Queens English’. As a piano and kazoo lead their way through a well constructed but – on the surface – somewhat childlike arrangement, it’s hard not to feel that DeMain isn’t channelling Newman’s often untrustworthy narrator. For those who’ve always enjoyed things in such a style, it’ll almost certainly have a little charm, especially for those who’ve followed Swan Dive’s works. ‘Extended Stay’ isn’t a bad EP by any means, not bad at all, but in a few places it lacks that extra spark. So far into a cult career, it’s great that DeMain has felt the need to stretch his legs and explore a few (slightly) different musical avenues, but, with the sheer amount of singer-songwriter material out there just waiting to be discovered, this is a release which feels like a solid collection filler as opposed to the essential item it could have been. This entry was posted in singer songwriter by Real Gone. Bookmark the permalink.